P., Elizabeth (2005) Efektivitas LVEP (Living Values: an Educational Program) dalam meningkatkan harga diri remaja akhir di Jakarta). Skripsi thesis, universitas Tarumanagara. The purpose of this research is to measure the effectiveness of Living Values: An Educational Program (LVEP) to increase self-esteem of the late adolescent. LVEP is a value educational program that provides various types of experience activities and practical methodology for teachers and facilitators. This program is intended to assist children and adolescent to explore and develop values. ln their development, adolescent require values in order to have a hold on their lives since self-esteem is based on values within one self. Self-esteem is a thorough evaluation on someone or other people's view on himself. The research iutilizing experimental quantitative methodology using questionnaire as the measurement tool. Data processing of the research is using t-test assisted by SPSS Program version 12.00. There are 12 subjects for the research divided into experiment group and control group. 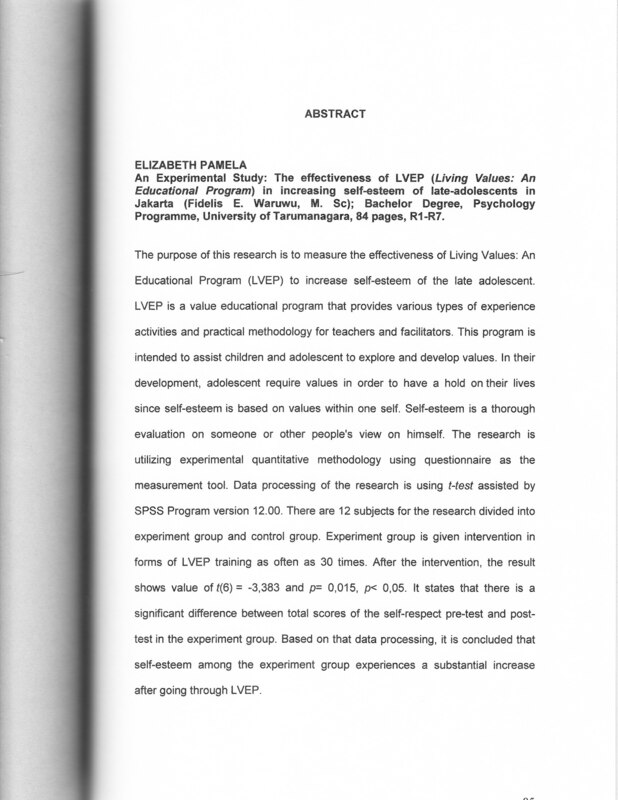 Experiment group is given intervention in forms of LVEP training as often as 30 times. After the intervention, the result shows value of t(6) = -3,383 and p= 0,015, p< 0,05. It states that there is a significant difference between total scores of the self-respect pre-test and post test in the experiment group. Based on that data processing, it is concluded that self-esteem among the experiment group experiences a substantial increase after going through LVEP.